We’d like you to welcome back Erika, our in-house creative guru and stencil fan. Erika spotted a plain wall and felt compelled to paint a stencil pattern on it. 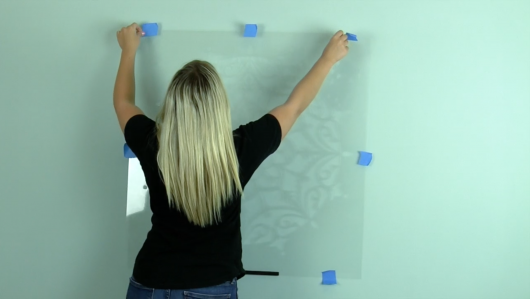 A stencil pattern is a great alternative to wallpaper because its affordable and easy. 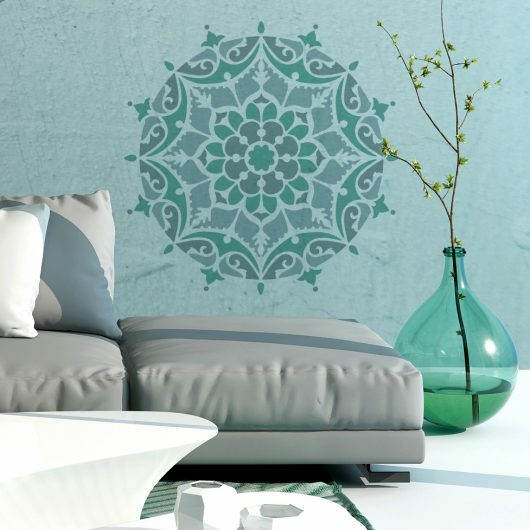 A Moroccan inspired stencil pattern, like the Estella Mandala Stencil is a great wallpaper alternative. 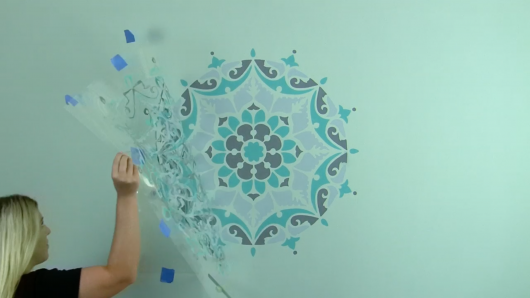 For our visual fans, Erika has put together this quick video using a Moroccan Stencil. 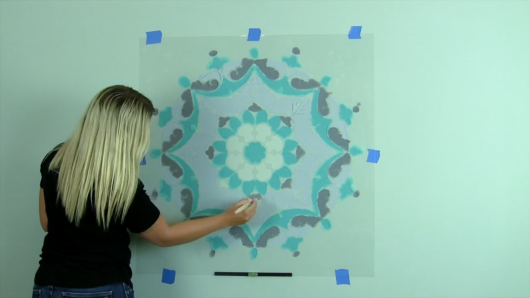 In this instructional video, Erika shows fans how easy it is to stencil wall art using this trendy Mandala pattern. Let’s walk through the steps for completing this fun stencil project. Erika started with a freshly painted light blue wall. She knew she wanted to add a splash of pattern to her wall and a stencil pattern is the perfect way to do so. 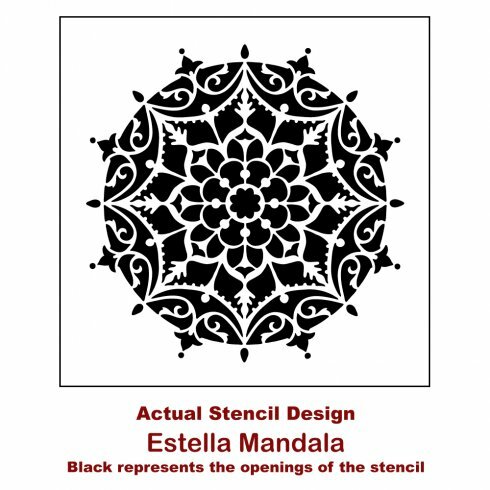 She browsed our large collection of stencil patterns and fell in love with the 30 inch Estella Mandala pattern. This pretty pattern has an antique wrought iron influence. Erika was ready to start stenciling once she had her Mandala stencil in her hand. She carefully taped the stencil to the wall. Then she used the clip-on stencil level to ensure the pattern was even on the wall. This clever tool is extremely helpful when completing a project on the wall. Erika chose to paint the Mandala in three colors. 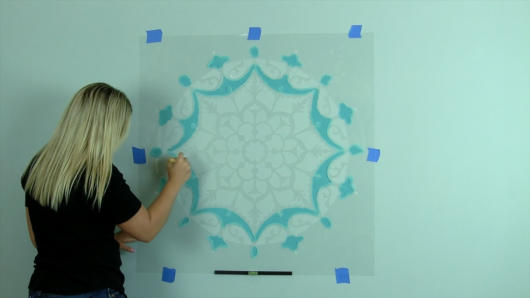 She used a stencil brush to paint part of the pattern in a blue-green hue. Erika made sure she brushed off any excess paint on a piece of paper towel. Too much paint will cause the design to bleed. She used a dabbing or pouncing motion when using the brush. 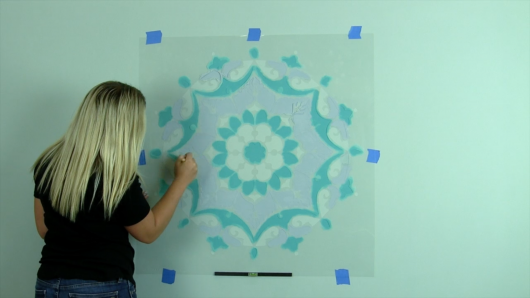 Erika carefully removed the Estella Mandala Stencil from the wall to reveal the design. We think seeing the painted pattern is the best part! When the wall art was complete, Erika slid her decor back into place. She then stepped back to admire her personalized wall art. Are you ready to see how this accent wall turned out? We thought so! Tell us, where would you stencil this eye-catching Mandala wall pattern? Leave us a comment below, we’d love to read your thoughts!